Fancy turning the Agnes top into a dress? 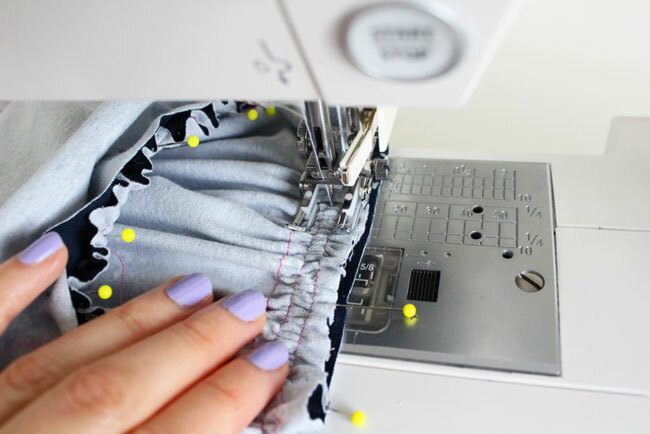 Today I’m going to show you a simple pattern hack – adding a gathered skirt to the Agnes sewing pattern. Essentially all you’re doing is gathering two rectangles up to fit your waist – easy peasy… and so very wearable! You can choose where to position the waistline on this dress, depending on your style and what shapes you think suits you – on your natural waist, higher up for a smock style, or even a drop waist dress if you fancy. 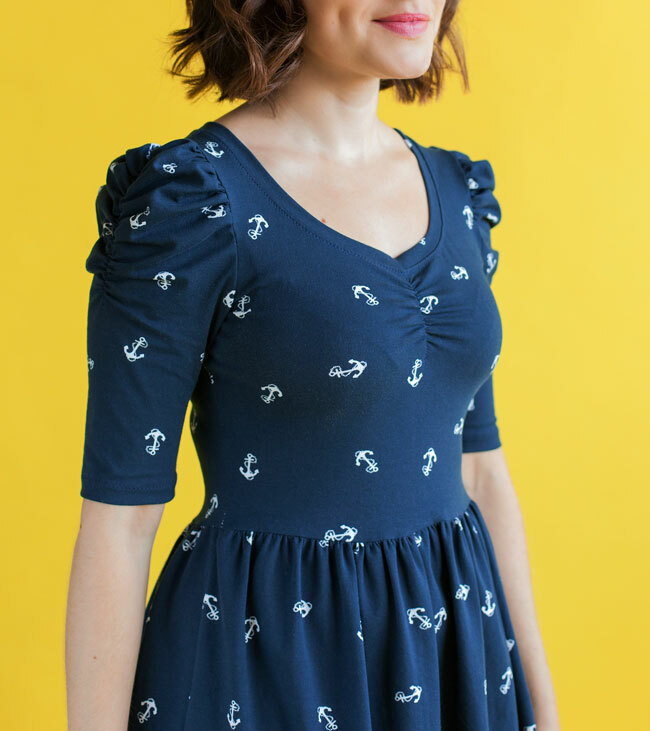 I’ve sewn the ruched sleeve and ruched sweetheart neckline version of the Agnes top - it’d also look lovely with the plain long sleeves and scoop neckline. 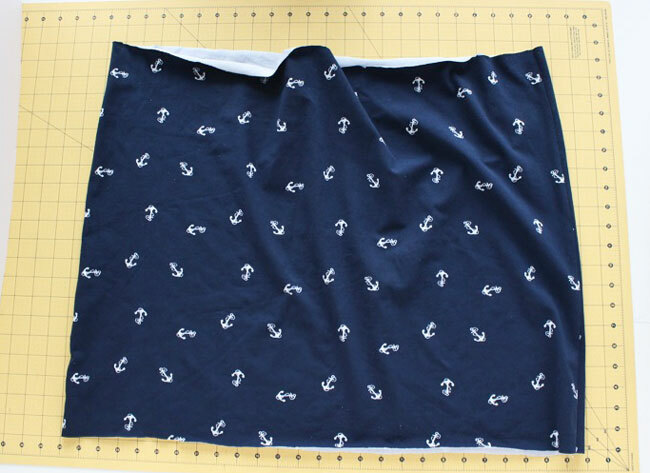 This fabric is a jersey that’s printed on one side with anchors - I bought it from MyFabrics (at the time they had a pretty gorgeous red version too). It’s not the softest fabric in the world, and the white wrong side shows through a little when it’s stretched, but the print is pretty cute. You’ll need a bit more fabric than you usually would for the Agnes top on its own. It’s hard to say exactly how much because it will depend on the size you decide to cut your pieces, so you might want to measure up first and then buy your fabric. Okay, on with the tute! 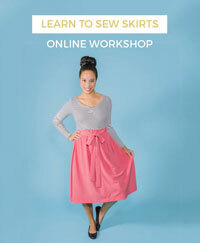 1) Decide how far above or below the waist you want the skirt part of the dress to start. 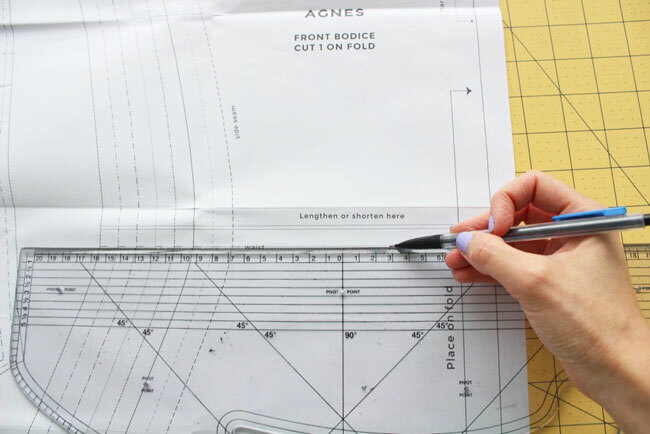 The waist is marked on the front bodice piece of the Agnes pattern with a notch – draw a horizontal line above or below waist where you want the skirt to join the top. 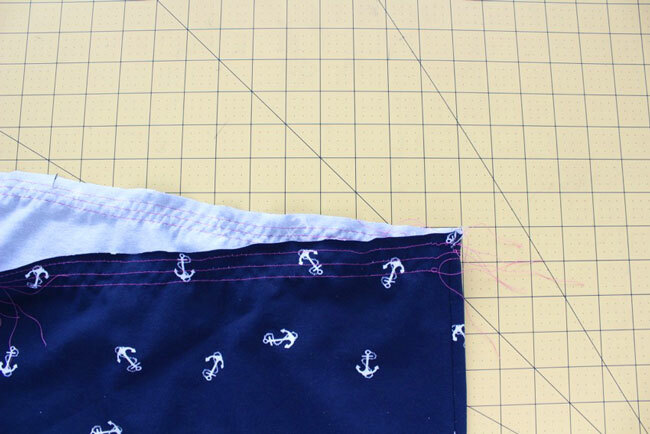 Add in the seam allowance by drawing another line 15mm (5/8in) below this line – this will be your cutting line. Bear in mind that if your fabric stretches lengthways as well as widthways, the weight of the skirt will pull the waistline down a little – in which case, you'll need to take a bit of extra length off the top for stretch. If the side seam above the cutting line is at an angle, square it off so it’s at a right angle to the cutting line for at least 15mm (5/8in). Repeat this step on the back bodice piece too. 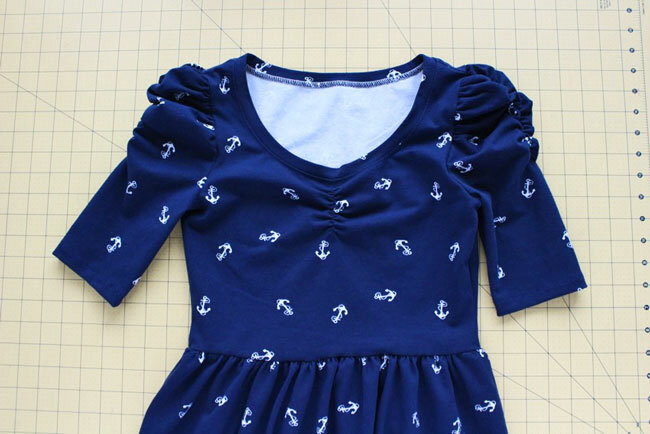 2) Sew the Agnes top following the instructions that come with the pattern or our online video class - but don’t hem the bottom of it. 3) Now we’re going to cut two rectangles of fabric for the skirt. 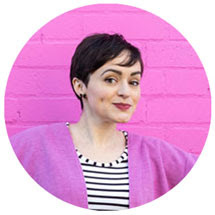 If you’ve made the Clemence skirt in my book, it's a similar process. The length of each rectangle should be the length you want your skirt to be from where it joins the bodice to the hem + 15mm (5/8in) seam allowance + 20mm (3/4in) hem allowance. Working out the width of each rectangle isn’t an exact science – it depends on how gathered you want the skirt to be. As a guide, try 1.5 x your hip measurement for the full width of the skirt, so half of that for each of the two rectangles. All I did was cut the 150cm wide piece of fabric I had in half, making the whole thing just over 1.5 x my hip measurement. Cut two rectangles to this size, making sure the sides run parallel to the straight grain of the fabric so it isn’t twisted (similar to how you cut the top). Fold each piece in half widthways and snip a notch at the top of the fold to mark the centre. 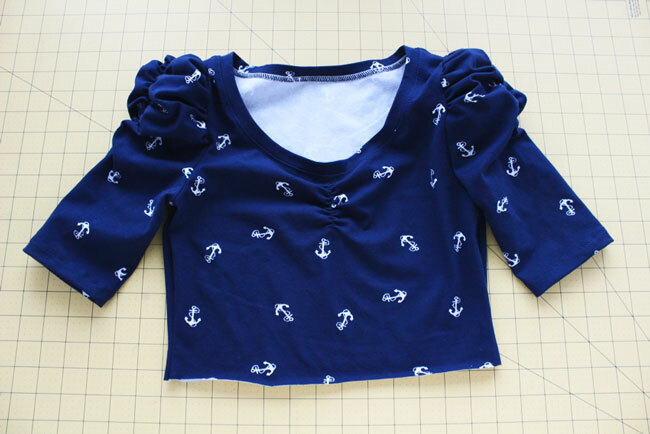 Fold the Agnes top in half too and snip notches at the bottom of each fold to mark the centre. These notches will help us join the pieces together and spread the gathers out evenly later. Sew the rectangles together at the side seams. Press the seam allowances either open or towards the back. 4) We’re going to sew gather stitches to the top edge of the skirt to gather in the waistline. Thread your machine in a contrast colour thread and set it to a longer stitch length (4-5mm). Starting next to one of the side seams and about 5mm (1/4in) from the top edge of the skirt, sew three horizontal rows of stitching about 7mm (1/4in) apart, from the side seam to just before the first centre notch you come to. Sew another three rows from the centre notch to the side seam; another three from the side seam to the next notch; and a final three rows from the second notch to the side seam. Chunking up (technical term) the gather stitches like this will make it less likely that the threads will snap when we gather up the fabric in the next step. 5) Flip the skirt over the top at the waist, bringing them right sides together. 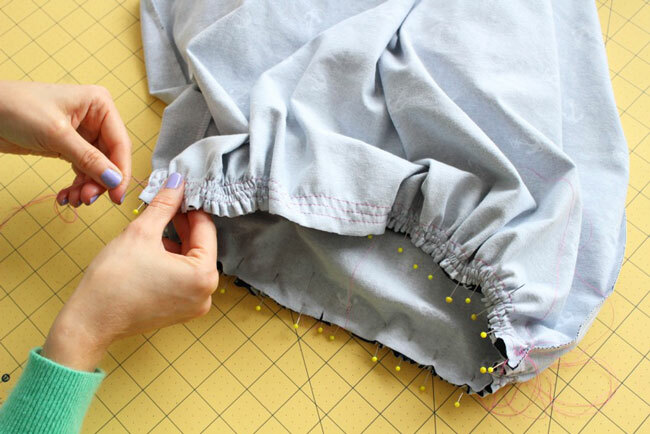 Pin them together at the side seams and at the centre notches. Pull on the top three threads of one set of gather stitching until this part of the skirt fits the part of the top that it’s pinned to. (It’s safest to pull from both ends so the threads don’t come out!) 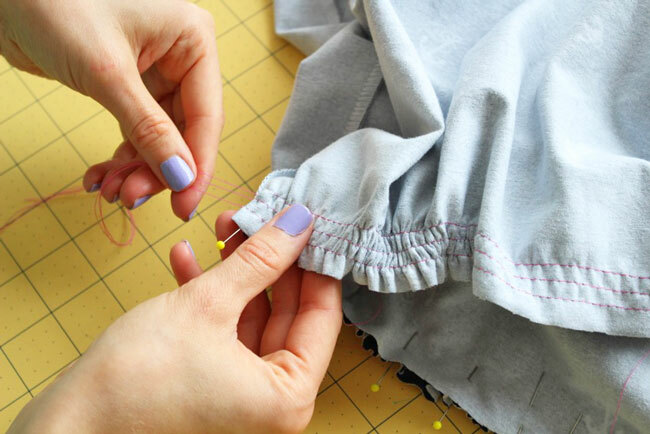 Smooth out the gathers with your fingers so they’re evenly spread, and secure the skirt to the top with plenty of pins. Do the same thing on each section of gather stitching. 6) Turn the skirt to the inside of the bodice so you can sew inside the waistline without the gathers getting squidged up on your sewing machine. With the machine still set to a longer stitch length, tack (baste) the skirt to the top along the waistline. Take your time here to keep the gathers nice and even – you can pause with the needle down when you need to, raise the presser foot and readjust the gathers with your fingers. If you’re happy that the gathers have gone in smoothly and evenly, rethread your machine in a matching colour, reset the stitch, then sew the waist seam for real. 7) Unpick the gather stitches and tacking (basting). Press the seam allowances down towards the skirt, taking care not to press out the fullness created by the gathers. Hem the skirt following the instructions for hemming the top. Love at First Stitch Lovers Meet Up!